When I first saw this in the video list, it was marked as being from 2018. Which is surprising, since I figured I would have heard about a new Tales from the Crypt project being made. Turns out it’s actually just a 2018 remaster of the 1972 movie. Oh well, at least it has Joan Collins and Peter Cushing in it. Though there is a disappointing lack of cackling skeleton Crypt Keeper and instead we get a grumpy monk Crypt Keeper. The basic premise for the anthology of short horror stories is that a group of 5 people get separated from a tour going through a crypt. They find themselves trapped in a room, face-to-face with a weird robed man that gives them each visions of how they will die. Each of the visions plays out in ways that are very true to the original Tales from the Crypt comic books with people dying in ways that are generally comeuppance for being a terrible human. Not all have supernatural aspects but they do all end with the person getting spooked about their future. Spoiler alerts: these aren’t visions of how they will die but instead visions of how they did die and they are in Hell now. Surprise! Right off the bat, I have to say that I was so happy with Peter Cushing in this because he got to play a sweet, old man that made toys for kids and loved his dead wife very much. I’m glad he didn’t have to play the bad guy or a secret murder man or an intense dramatic thing. Sadly, his was probably the most boring as it was just “Rich guy destroys a dude’s life until he commits suicide. Dude comes back from the dead a year later and kills him.” That’s the most stock standard story you could imagine for a Tales entry. Joan Collins’ story was also pretty bland as it was just she kills her husband on Christmas Eve and then a psycho dressed as Santa kills her. 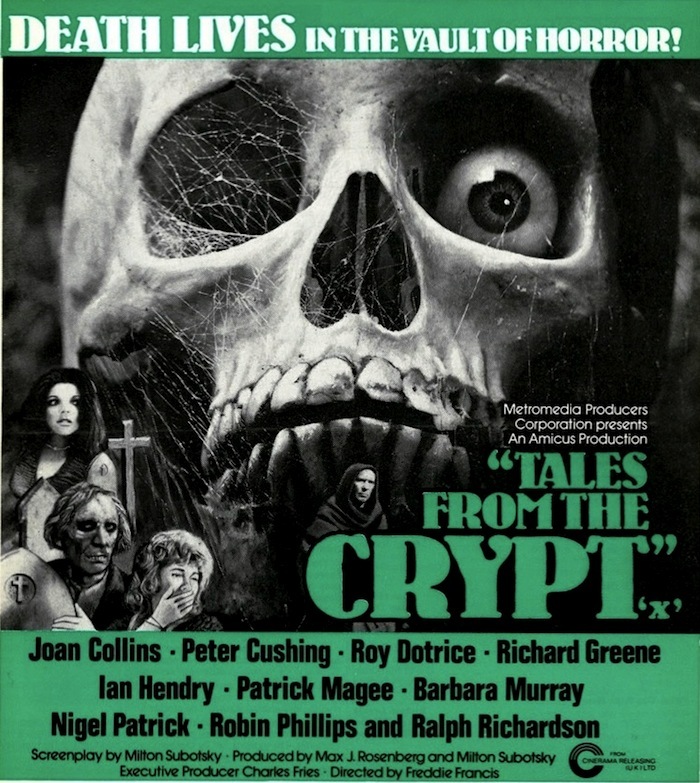 Honestly, if you’re family with the Tales from the Crypt stories at all, there’s basically only one of the shorts that goes the extra mile for being interesting. While the stories themselves weren’t anything special; that does mean you get exactly what you are coming for when you see the movie title. The effects are pretty bad since they are in that limbo of space in ‘70s horror where you couldn’t rely on black and white to cover up things looking bad and unless you had a big budget, you were reduced to using things like red paint for blood and gray face paint for dead people. Thankfully the actors they got were all good and the movie being an anthology format means that my main complaint of movies from the ‘70s where people mill about and waste time in order to stretch the content isn’t a concern. Though it isn’t quite as campy fun as the HBO series or the movies from the ‘90s, I think this version is still ok. It’s a 2.5 out of 5. Entirely average.